A month ago, I wrote WD's HGST unit revealed the world's first 14TB helium-filled HDD. This enterprise disk uses shingled magnetic recording (SMR) technology, spins at 7200RPM, has 512MB cache and is capable of hitting write speeds of up to 233MB/s, which doesn't really sound exciting given the much higher performance offered by SSDs. Now there's word from AnandTech that WD started shipping its 14TB HDD. Pricing is unknown as WD isn't shipping the disk to general customers, it's exclusively available to select cloud and hyperscale datacenter clients. 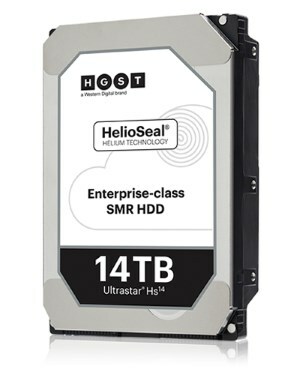 The HGST Ultrastar Hs14 relies on Western Digital’s fourth-generation HelioSeal enterprise platform which integrates eight platters and features various internal components specially designed for such hard drives. The new helium-filled HDD has a 7200 RPM spindle speed, a 512 MB cache. and numerous enhancements when it comes to reliability and durability of the drive. As with other HGST enterprise-class HDDs, the Ultrastar Hs14 is rated for 2.5 million hours MTBF and comes with a five-year warranty.